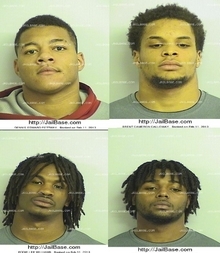 (AJC) --- Three University of Alabama football players were arrested Monday on robbery charges and a fourth was accused of fraudulent use of a credit card, according to Tuscaloosa County Sherriffs Office records posted at jailbase.com. Police booked Eddie Williams, 20, Tyler Hayes, 18, and Dennis Pettway, 20, on second-degree robbery charges and also accused the three of fraudulent use of a credit card. Police arrested teammate Brent Calloway, 20, for alleged credit card fraud. Tuscaloosa police had arrested Williams on Monday and charged him with carrying a gun without a permit, according to the Sherriff's Office. Three of the players players were reserves on Alabama's 2012 BCS national championship while Williams did nit play during the 2012 season. SB Nation noted that the players were top recruits for coach Nick Saban. An Alabama spokesman told USA Today that the school is aware of the arrests but had no immediate comment.